Now Offering 1 Bedroom Furnished Suites from $1700 - Call for Details! 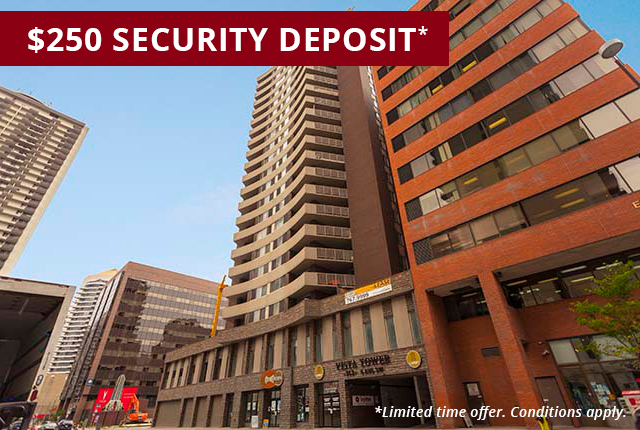 Vista Tower apartments for rent in Calgary welcomes you to the heart ofdowntown where security and style make our suites truly your home. Spacious,renovated rental apartments offer cosmopolitan comforts and old-fashioned valuein the City's most convenient location. Enjoy living at one of the mostdesirable and livable locations in Calgary. Vista Tower is nestled close to theBow River and Bow Trail at 9 Street SW – where city dwellers conveniently shop,work and play. With thoughtful layouts and just eight suites per floor, Vista Tower apartmentsuites appeal to the most discerning residents. Relax in tasteful surroundings,or unwind on your private balcony, set above the bustling cityscape forinspiring mountain views. Recreation and educational pursuits are withinblocks, including public and private schools, colleges, and the University ofCalgary just minutes away. Residents of Vista Tower come home to an updated, well-maintained building andgrounds, attentive property management and staff, dual elevators, secureunderground parking and on-site, state-of-the-art laundry facilities.Complementing urban lifestyles is easy proximity to the C-Train and otherpublic transit, along with the vibrant, modern cityscape of restaurants, shops,office towers and all that urban living city has to offer, right outside ourlobby door. See how beautifully style and convenience meet at Vista Tower today. Call orvisit our rental office for a personal tour of our Calgary apartments with one of our friendlyrepresentatives. ASK ABOUT OUR FURNISHED 1 BEDROOM SUITE! Only steps to LRT, Public transit allows for easy access to downtownCalgary's many grocery stores, shops, restaurants and coffee shops. Close to University of Calgary, SAIT, Bow Valley CollegeConnaught PS, Mount Royal MS, and Western Canada HS. Bike, Jog, Hike, or walk along the scenic 48 kilometer BowRiver Pathway. Relax in tasteful surroundings above the bustling cityscapefor inspiring mountain views.